Why are so many veterans homeless? I took a deep breath and explained. Often times in war, men and women see or experience things that damage their body or mind. Because of their military service, these heroes have a higher risk of experiencing traumatic brain injuries (TBI) and Post-Traumatic Stress Disorder (PTSD), both of which have been found to be among the most substantial risk factors for homelessness. Veterans face the same shortage of affordable housing options and living wage jobs as all Americans, and these factors—combined with the increased likelihood that veterans will exhibit symptoms of PTSD, substance abuse, or mental illness — can compound to put veterans at a greater risk of homelessness than the general population. In other words, the damage they got in war can lead to the things that lead to homelessness like loss of jobs, divorce, or addiction. A 2015 study of veterans initiating medication-administered treatment screened each of these patients for risk of homelessness and found that the prevalence of homelessness in veterans with opioid use disorder is 10 times more than the general veteran population. Some just want to escape the pain of what they saw, or what they experienced. Veterans are more likely than civilians to experience homelessness. 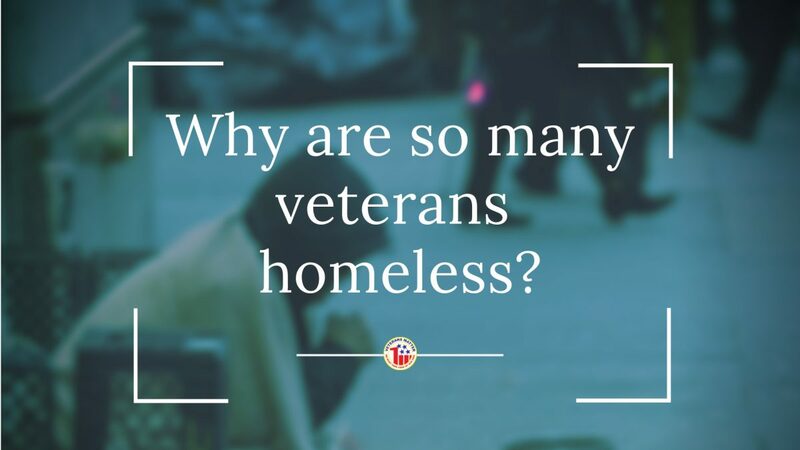 Like the general homeless population, veterans are at a significantly increased risk of homelessness if they have low socioeconomic status, a mental health disorder, and/or a history of substance abuse. Our friends at the National Coalition for Homeless Veterans has put together a nice page with more statistics. Among the recent Iraq and Afghanistan cohort of veterans—who are more frequently female than their older counterparts—an experience of sexual trauma while serving in the military greatly increases the risk of homelessness. Additionally, veterans often experience difficulty returning to civilian life after the regiment of the service, particularly those without strong social support networks back home. Others may not have skills that can be easily transferred to employment outside of the military. We partner with the VA homeless program staff to identify the veterans who have nowhere else to go! The VA social workers find the veterans’ appropriate housing and secure their long term HUD VASH housing voucher. When the housing has been inspected and the veteran is ready to sign the lease, the VA social workers access our online system and complete the short referral form requesting the deposit, and hit send. Immediately, all conforming referrals are approved and the social worker and landlord receive an email confirmation approving the deposit amount and the check, which was YOUR donation, is mailed the same business day directly to the landlord. You have just been a guardian angel to a homeless veteran who had nowhere else to go to find the deposit. On average, the veterans we have housed needed an average deposit and first month’s rent of $750. After the veteran and their family is housed, this $750 unleashes over $75,000 in additional services including employment, medical, mental, and addiction services provided by the VA and local community collaborators. This means every single dollar we deploy results in another veteran housed in permanent housing that has a 91% success rate keeping them housed. On behalf of every one of those on the streets, the 2,800+ you have now helped house, we say thank you!